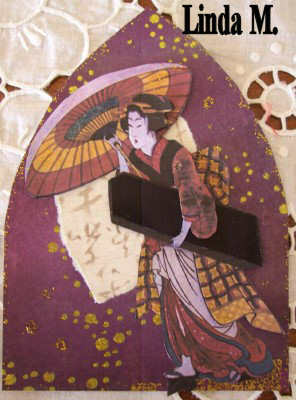 Linda M. is our hostess this week and she selected the theme “Asian” as our challenge. Linda created this beautiful arch to share and inspire us all. What comes to your artistic mind when you think of Asian….geisha girls? temples? beautiful costumes? Whatever it may be – we want to see it here in arch form this week! I’m Linda (redplaid3) and I live in Bear, Delaware, where I am a SAHM and artist. I enjoy making cards, ATCs, and little books and altering puzzle pieces. I love patterned paper and buttons also. Lately, I’ve been trying my hand at digital cards and layouts. It’s been fun, but nothing beats the look of a piece with all handmade elements. Have fun trying this Asian theme. I’ll be away on vacation most of this week, but I’ll catch up when I get back. Here is Linda’s gorgeous arch for our challenge! thank you for being hostess!! Thanks for the very nice theme. thank you for the theme Linda! It really made me think outside of the box! Well here is mine. A great theme. Wonderful Theme. Here is my arch. Thanks for looking. dit is mijn bijdrage . Wow, love this theme !! Here is my entry for Gotisch Arch Asian. My first entry at Gothic Arches. It’s on my blog. My Asian entry for this week. What a wonderful theme again! Thanks for looking and leaving me a comment! What an awesome theme! I had to step out of my usual box, but I’m pretty happy with the result. Now, to go see what everyone else has done! Here is my entry for this week! How do you all get on so quickly?! Here are my Asian flowers. My asian arch is here. My Asian arch is on my Blog! I don’t seem to be able to leave comments on eija and aino’s blogs as I keep getting a message that I’m not authorized. Any help would be appreciated but I want them both to know I love their arches!! I also cannot leave comments at eija and aino’s blogs – beautiful arches ladies! I’ve been looking at everyone’s fabulous artwork on this challenge for ages now. Here is my first arch – using washi papers, Japanese calligraphy stamp and collage pieces from a Sunday supplement. Thanks for a great theme!! Hi! I have received the message, that some people can’t left a comment in my sites. I have left a message about problem to support, there have been difficulties last few days, I hope that the problem will solve soon. Thank you for all who are managed to leave very nice comments. Here is my entry, nice theme! Here is my first attempt at a gothic arch … these are really fun! Thanks for an awesome challenge! thank you it was really great to make it !